#NaNoWriMo 2017: Two Winners In One Household! Yay! We did it. My son Joshua and I managed to write the opening 50,000 words of our novels between November 1-30 during National Novel Writing Month 2017. This was the first time either of us had participated in NaNoWriMo, but we both felt the urge to do something that stretched us to the limit. At one stage I was about a week behind with my word count and thought I wouldn’t make it, so had to do some mad 3,000 plus sprints per day to catch up. Joshua managed to be more consistent in his progress but was a bit erratic in updating his word count on the NaNoWriMo website, so his final stats and graph looked a bit strange, which is why he wanted me to post mine and not his. 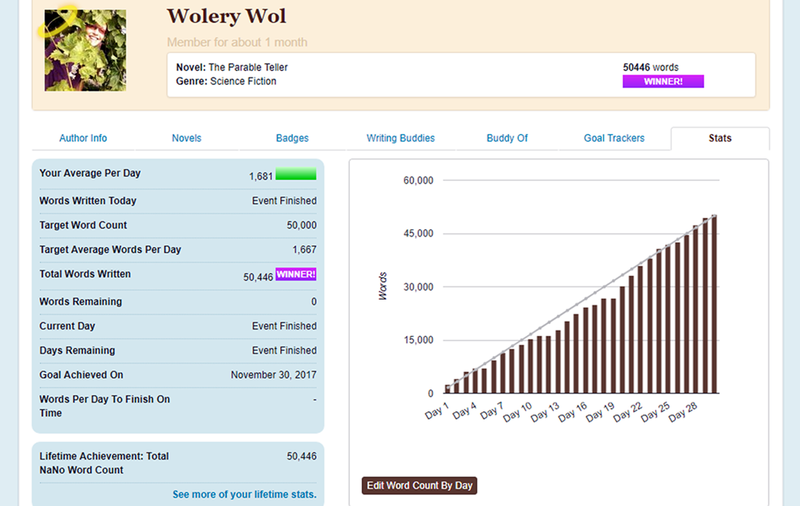 In case you are wondering who Wolery Wol is, that is one of my online author usernames/pen-names. My novel, which will probably end up at about 75,000 words in length, was inspired by a short story I wrote way back, titled The Parable Teller, so this is what I chose as my working title during NaNoWriMo but ir won’t end up as my final title as it is no longer suitable. This, my sixth novel, was intended as an exercise in shutting off that pedantic inner editor and recapturing that creative energy and dynamism that went with writing my first novel years ago. It worked, but doesn’t mean that I will skimp on the editing during revision 1, 2, 3, 4, or however many it takes. When I started the novel I thought it was science fiction, but after writing the first three chapters, it dawned on me that it wasn’t science fiction but mainstream satire, which happens to be set at an unspecified time in the future (think Ben Elton meets Jonas Jonasson). In fact, it is possible that I have never written true science fiction, or true fantasy for that matter. [Thank you, Bob Shaw for your book How to Write Science Fiction, which has been lurking on my bookshelf since 1993, and became my only reading material throughout November. It would have saved me from a lot of marketing problems, if I had read your book properly in the first place. Next on the list is Writing Fantasy Fiction by Sarah LeFanu, on my shelf since 1996]. My enlightenment has proved a liberation, as I am now free to embrace my quirkiness without the strictures of rigid genre. My son’s novel is his first, although he has written plenty of short stories (you can read one of them here), plus he has a BA in History, English and Creative Writing. He likes to write fantasy: real fantasy, unlike his mother! His novel, which also has a working title that he intends to change, will end up much longer than mine and sounds potentially epic. Lastly, I want to award my husband a medal for his patience and encouragement throughout November. It must be hard enough for anyone living with one NaNoWriMo maniac for a month, but to live with two, you have to be some kind of saint. No, not a saint, just someone who loves you. Congratulations! That is a huge accomplishment for both of you. I think it is very cool that you and your son did it together, and that is great news that you have a flame rekindled from the exercise. Bravo on both counts! What a wonderful birthday gift to yourself, Sarah! Congratulations to you and Mr. J; I already knew you were both winners, though. 🙂 Have a wonderful, splendid, creative, and magical birthday! Thanks, Leigh 🙂 Just as well we got there, or I might have had a long face on my birthday! It was a good birthday, although I had a day off being creative as was feeling a bit exhausted by the end of November. We had a great evening out. The three of us went to our favourite Thai restaurant, where the food is yummy+++ and the waitresses have the most impeccable manners 🙂 I just have to remember that it is traditional where they come from, for the men to get served first! Jolly good stuff! Congrats! Don’t forget to get your certificate (if they still do them) print it and display it as a reminder of the ace achievement! Thanks, Dave. Yes they do still have the certificate, although I guess I’m beholden to put my working title on it that I used throughout NaNoWriMo, and not the one I’m going to end up with. I also wasn’t sure if I was meant to put my real name on it, or my user/pen-name. At the end of the day, the displaying of the certificate is for my enjoyment, so it doesn’t matter which title or name I use. Thank you, Prior 🙂 It did feel like immersion and I haven’t yet fully surfaced as the novel isn’t yet finished, but now I can pace myself a bit and be half-sociable instead of totally unsociable! Thanks, Sunshine 🙂 .Whether I have been writing satire all along, I’m not sure — maybe snatches of it — but I felt the need to see the funny side of things big-time, (albeit darkly so in places), as the world has gone rather crazy this year and is probably destined to go crazier still! congratulations Sarah to you both!!! Thank you, Cybele 🙂 We’re still plugging away at our novels, although I’ve slowed down with the writing a bit, in order to do some necessary research. The novel is going in a most interesting direction and is most definitely not science fiction anymore, but it continues to be typically quirky and so you won’t be disappointed! Hi Sarah – Congratulations on your completion of NaNoWriMo! I have often thought about doing that, but I wonder what happens to the work you submit. What’s to keep it from being stolen? Did you feel concerned about that at all? What did you like or not like about the experience? Hi Carla, thanks for the congratulations 🙂 I don’t think there’s any chance of anyone’s work being stolen, as you don’t write your novel onsite but only upload it when you’ve reached your 50K, at which point their system scrambles the words so it is literally a word count and nothing else. Also, the majority of participants won’t have completed their novel at 50K and, even if they have, who wants to take on the mess of a first draft and sort it out? I’ve written a testimonial of my experience for NaNoWriMo, and will be publishing it on my blog later today. I would say, go for it, Carla, but prepare to be exhausted. Also, I think you very much have to make sure ou have the backing of anyone else who lives in your household, so as to minimise stress. That makes sense, Sarah. Perhaps you will repeat the experience in 2018? Previous Previous post: Friday Fictioneers — Magenta and Cyan Equals Purple, Right?